Some of my best outsourcing tips. I’ve been around this online marketing game for quite a while now and every time I say the word “outsourcing” I get one of two reactions. The first is a look of intrigue – the idea of building an outsourced team is enticing to most business owners. It can really save you time and money. The second is a look of horror. Either the person I’m talking to is scared of the prospect of managing a team of staff half way around the world, or they have tried it before – and failed miserably. Both of these reactions are perfectly normal 🙂 A lot of online business owners have major problems when it comes to outsourcing. Many have tried and failed. Some still continue to implement outsourcing within their business, but can’t seem to achieve the results they’re looking for. This begs the question… So why bother? Well, anyone that’s tried building an online business knows it’s literally impossible to do all the work yourself. Whether we like it or not, online marketing has become a “Team Sport”. If you have a great team, the reality is you can get more done with less work, and achieve far greater results. In fact, I don’t know anyone who is really kicking goals online who doesn’t have a strong team behind them. Outsourcing can cut both ways. If you implement it correctly, it can be the best thing that happens to your business, BUT if you get it wrong, it can be a disaster – wasting loads of time and money. In this video I’ll show you how to build a team of ‘A Players’ using the “George Foreman Method”. This is the exact method I use to attract, filter, pick and train team members for Melbourne SEO Services. You’ll discover how you can model this same process to build a high impact team at a fraction of what you might expect to pay. As I mentioned, this video was actually made for the Noble Samuari communitiy and I was pretty stoked with the feedback we got from it (click here to see what I mean! 145 comments and counting). Anyway, watch it now and let me know what you think! 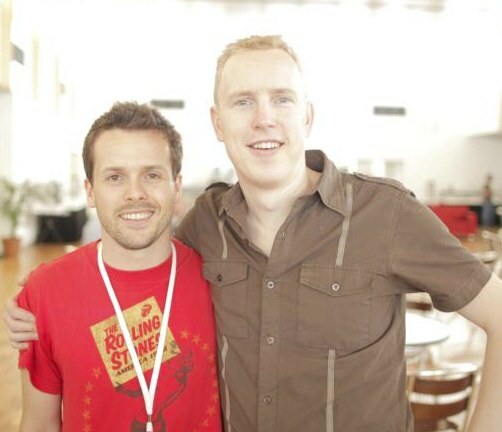 David Jenyns & Ben Stickland (from the Nobel Samurai team) - I think this photo makes me look short or maybe Ben's just a giant? I make absolutely no secrets of the fact that I am here today as an Internet Marketer because David Jenyns taught me almost everything that I know. The stuff he didn’t teach was stuff that I learned on my own and made my business unique – the secret sauce of every business. Naturally, when I crunch the numbers at the end of the month and see the growth in my business that I have been experiencing consistently over the past 12 months, it makes me thankful that from the beginning, I had an outstanding mentor, and surrounded myself with an amazing group of people. I’m not meaning to send a sucky email gushing about my mentor, dont get me wrong. I just wanted to share with you some free top notch training that Dave has teamed up with his buddy, Pete Williams, and published for free on the Noble Samurai blog. It’s worth making the time to check out. Even if you’re not ready to outsource, this is worth knowing, so that you at least know where you need to go from the point that you are at right now. For the sake of at least getting some good solid direction, please do not miss out on these. I like the idea of having a tandem interview as it does allow me to compare them to somebody else. I also agree 100% that it is very important that the interview happens over skype as I think it is important to be able to see the person that I am hiring. I think body language is very important and also I think it is important that I can see them when they are working for me. Another awesome educational video. The way you methodically outline the different SEO strategies you use, and step-by-step ways to grow an online Biz, is what sets you apart from the rest David! Good job. Hopefully meet-up when I get to Melb! Great video; clear and simple steps to follow. And great timing too! I have been polishing up my processes and getting ready write that job description. Your thoughts regarding full-time versus part-time if I feel I don’t have enough work for a full time person just yet? The timing of your video was outstanding. I’ve been experimenting with outsourcing for some time and have outgrown the o-desk type workers into hiring full time workers in PH. My first hire did not work out well at all as he just did not have strong enough English skills (writing and comprehension). So I ran another ad, got some good candidates and now you’ve helped me improve my process so that my next hire is an A player. Appreciate you stopping by and would love to catch up! no doubt we’ll bump into each other at some point. Wishing you well. Brilliant. For me it’s more comfortable to hear not, “How video was at all”. I think the better question is “Does it was Very Amazing or Super Awesome Amazing?”. David thanks for explaining the whole process and showing the real example. Right now I’m at the position of choosing that “A” person and I’ll take and apply all of your suggestions (better to say Solutions) about choosing the right person. And that video at Ed-ucation was amazing, I re-watched your for about 20 times, very cool. ps: I took several camera shoots of your G.docs account from that video =) Just kidding. YOU GUYS ARE PHENOMENAL!!! I was originally introduced to marketing through get rich quick schemes and products that sell high hopes… I now feel like I’ve graduated to a whole new level I watched video #2 first and feverishly took notes throughout the whole presentation. I look forward to hearing more from you guys, keep up the great work! Thanks for being so generous about sharing the exact process you use to find A players, train them and keep them. You make it very clear about exactly where to go to find those A players and how to maintain a great realtionship with them right the way through. David you still kill it with the blog posts. I’d really love for you and Pete to be the top guns in online outsourcing Dave. What you teach is so different from what I’ve encountered before as a remote worker. I’m biased but I think you’re doing things a whole lot better. This is what progressive HR people teach… LOVED IT. Florence, Pete’s VA, sent me an email with the link today. You guys rock.